Resting just above South Africa, Namibia is one epic country to visit in Africa. 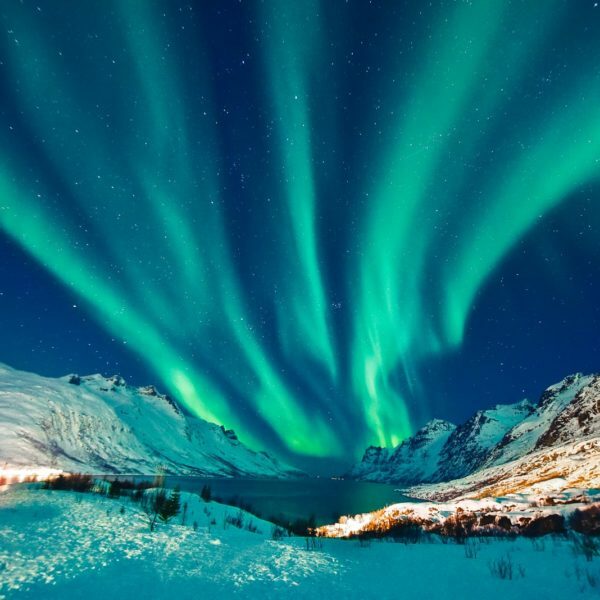 Of course, Africa is a diverse and incredibly beautiful continent; with places like Morocco, South Africa, Kenya and, of course, Namibia being proper-beautiful countries to visit. 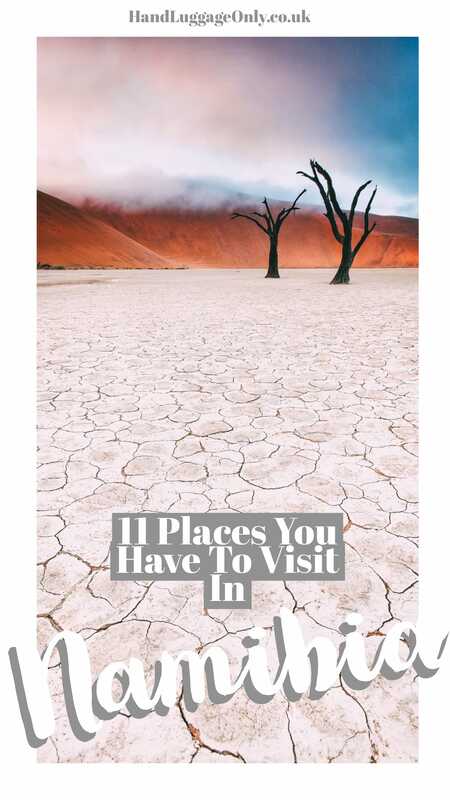 There is literally so many of the best places in Namibia dotted all over the country, which is perfect to explore. 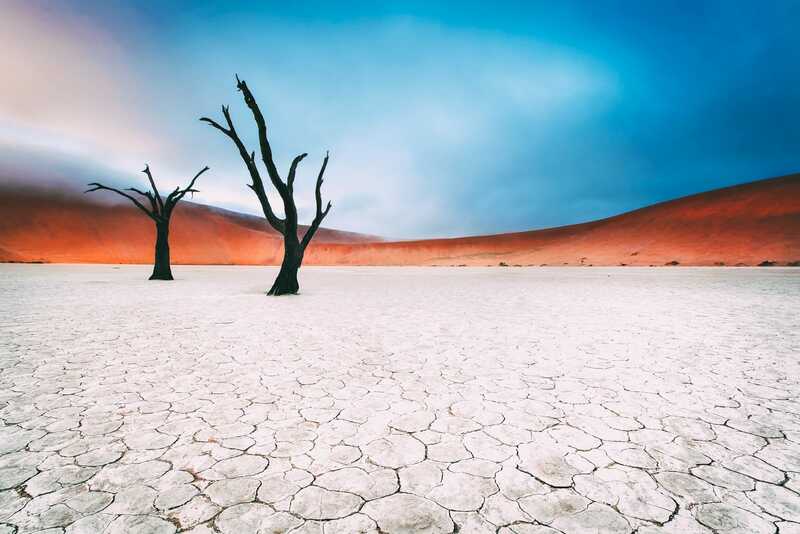 Now, the very best places in Namibia are totally eye-opening landscapes that, I swear, compare to nowhere else in the world. 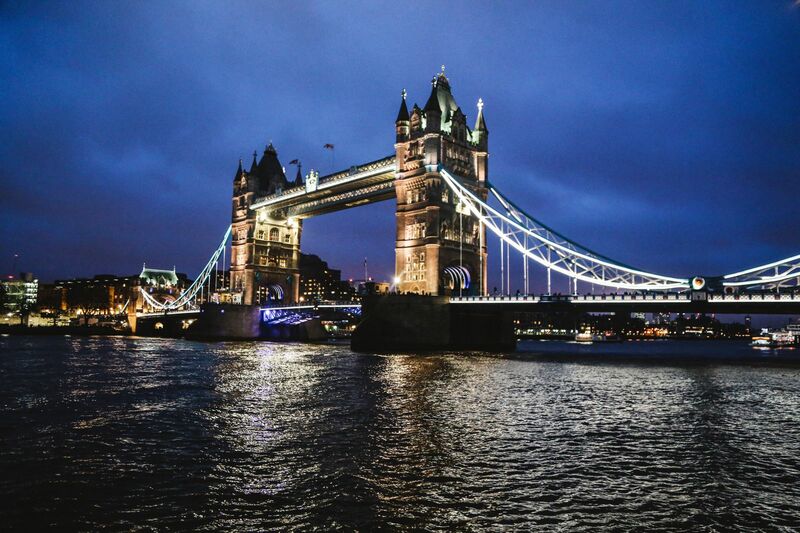 That’s what makes this country so very special. 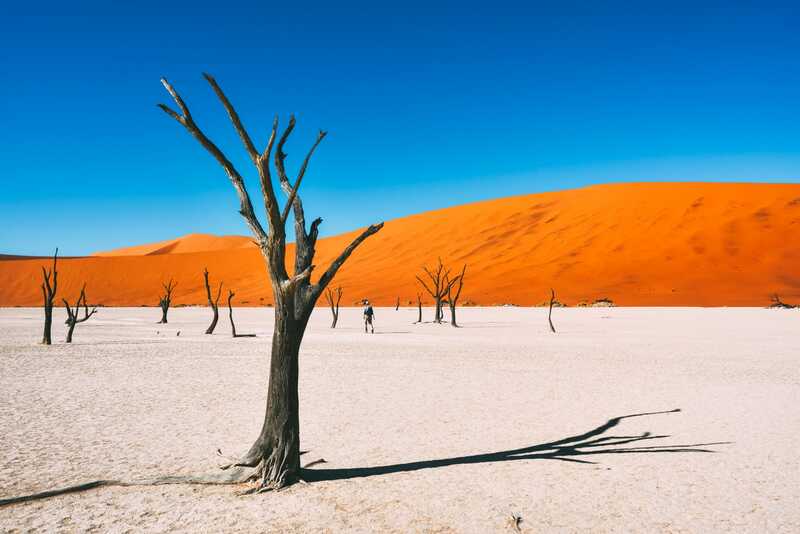 From bustling little towns, incredibly vast deserts to beautiful mountain ranges, it’s one place you should definitely think of visiting when in the southern hemisphere of Africa. The Himba people are some of the last semi-nomadic people in all of Namibia. 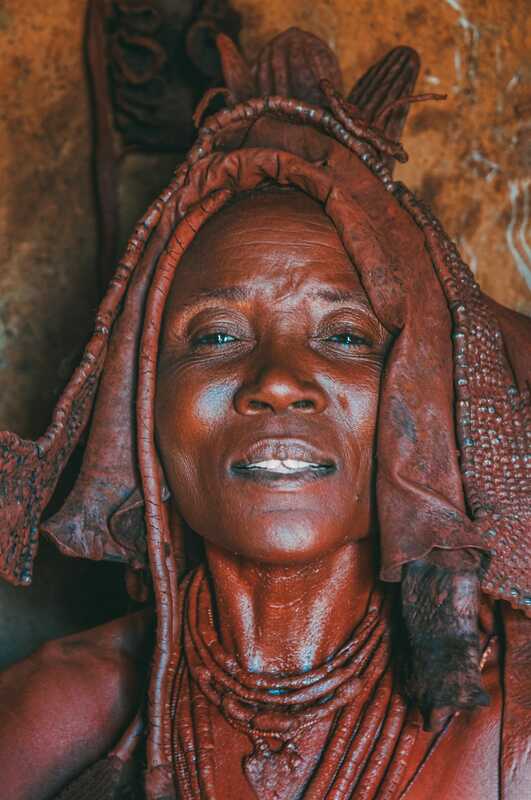 Once, cut-off from outside influence by the harsh desert and landscape, the Himba people have been able to hold onto many of their historic traditions and ways of life. Their incredible culture and red ochre that is rubbed all over the skin is so beautiful to experience. In lots of ways, the Himba people have managed to resist westernization and still cling to their deep-rooted heritage. The only way you can visit the Himba people is via a designated tour company at certain times of the year. As this changed each year, it’s best to check in with Namibia Tourism Information to find the specific companies offering a visit. It really is an authentic experience and one of the best places in Namibia to encounter. As with all visits, any interactions and visits should be considered with total respect for their community and sensitivity to their way of life. After all, no one likes a rude guest! 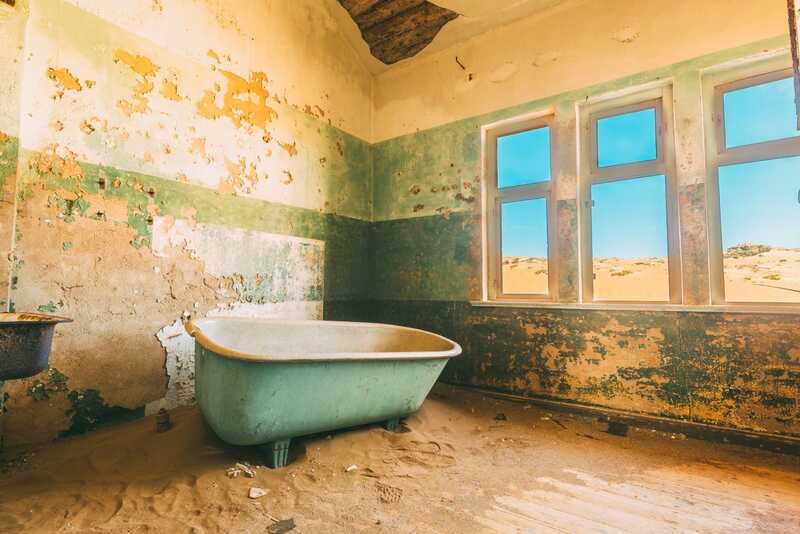 After a slump in diamond sales, Kolmanskop was completely deserted back in 1956. Although it once thrived with life and even had its own bowling alley, casino and a theatre. 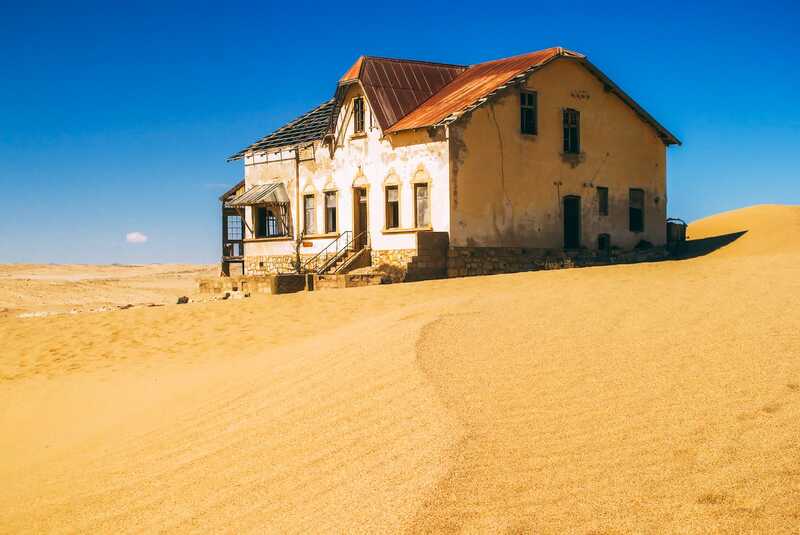 Nowadays, shifting desert sands and regal dunes intertwine with the abandoned buildings, making it a pretty haunting place to visit in Namibia. It’s pretty easy to drive to in a 4×4 or organised tour, especially as it’s only about 10-miles, or so, from the bustling port town of Lüderitz. Okay, so the best thing about Kulala Desert Lodge is its location. These gorgeous lodges are perched pretty close to the Sossusvlei dunes is one unforgettable place to spend a few nights. Best of all, each of the lodges has an intimate roof terrace where you can snuggle and sleep under the stars. The drive from Windhoek can be around 5-6 hours, so be prepared for this and on an earlier day flight to Namibia. 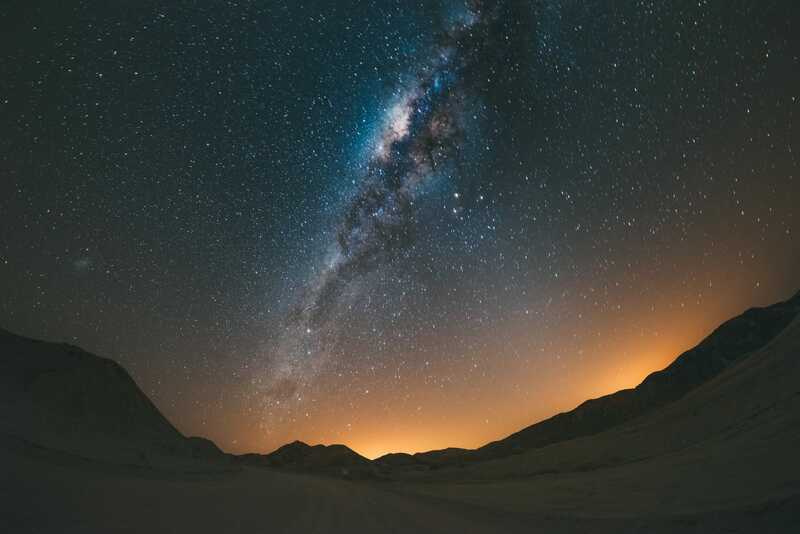 Though, let’s be honest, the drive is nothng when there is views like this… it really is one of the best places in Namibia to see the constellations. 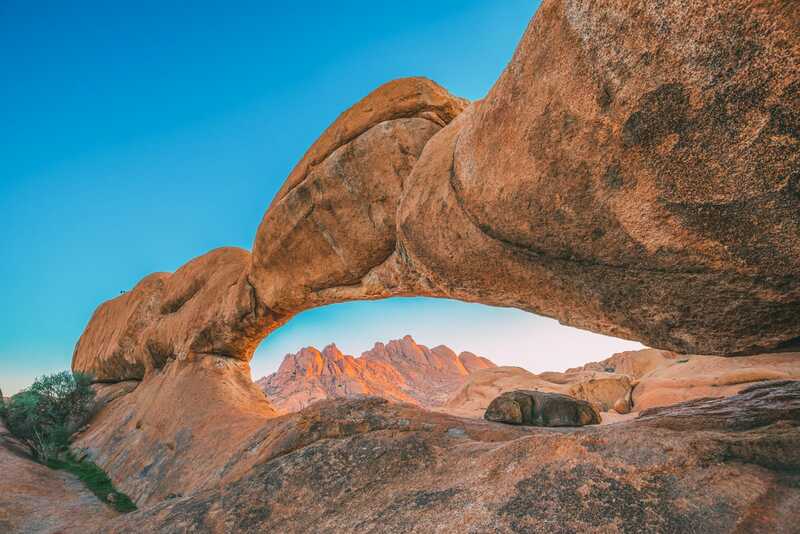 The Spitzkoppe Rocks are one of Namibia’s most famous landmarks and make a must-see location on any trip to Namibia. Rock-climbing enthusiasts may even climb them if they are brave enough –although they are just as beautiful when admired from the comfort of terra firma. Make sure to keep your eyes peeled for historic artwork that’s been painted onto the rocks many generations ago. 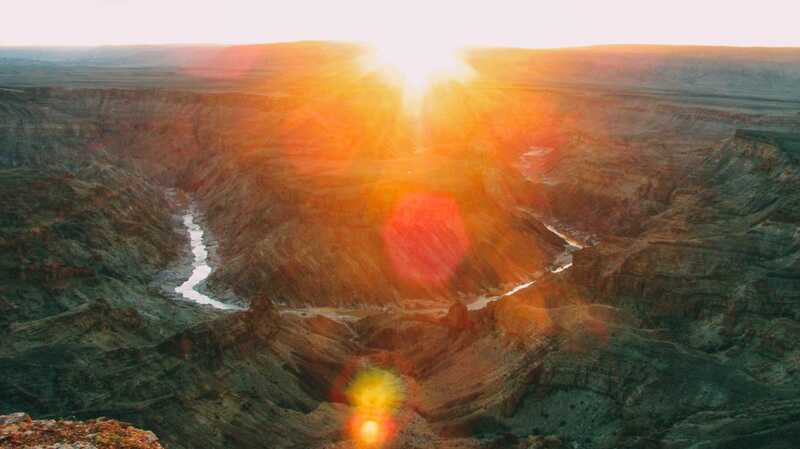 Fish River Canyon’s surreal landscape will make even the most blasé of travellers fall in love with this place. The canyon is a whopping 160km long and almost 30km wide, giving us visitor you some of the most dramatic scenery in the world to enjoy. 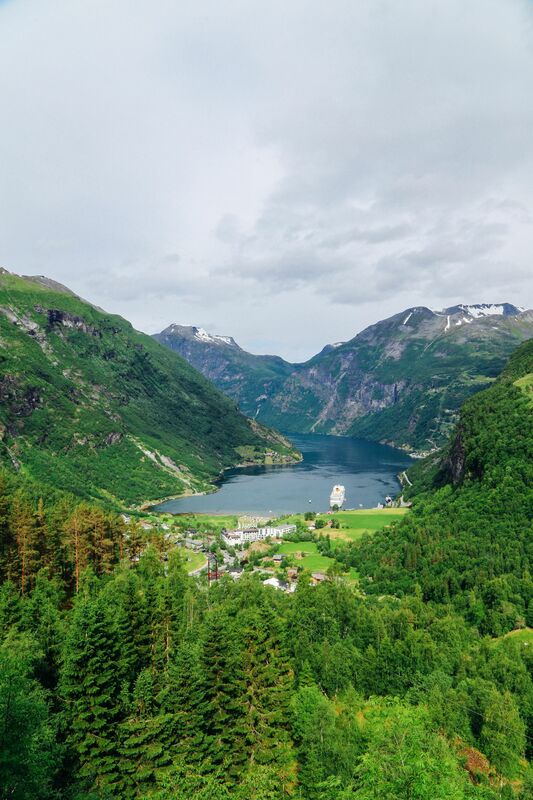 There are a few trails to hike (if that’s your thing) and vary depending on how tough you’d like your hike to be. 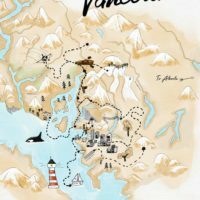 It’s possible to spend quite a few days hiking this region, so plan your visit and route well in advance. Best of all, always tell others where you’ll be hiking and if you’re not an experienced hiker, make sure to hire a reputable guide. ǀUi-ǁAis is the official name for the UNESCO World Heritage Site of Twyfelfontein. It’s one stunning place to explore the largest concentration of petroglyphs (rock carvings) in all of Africa – and totally worth a visit when you’re in Namibia. 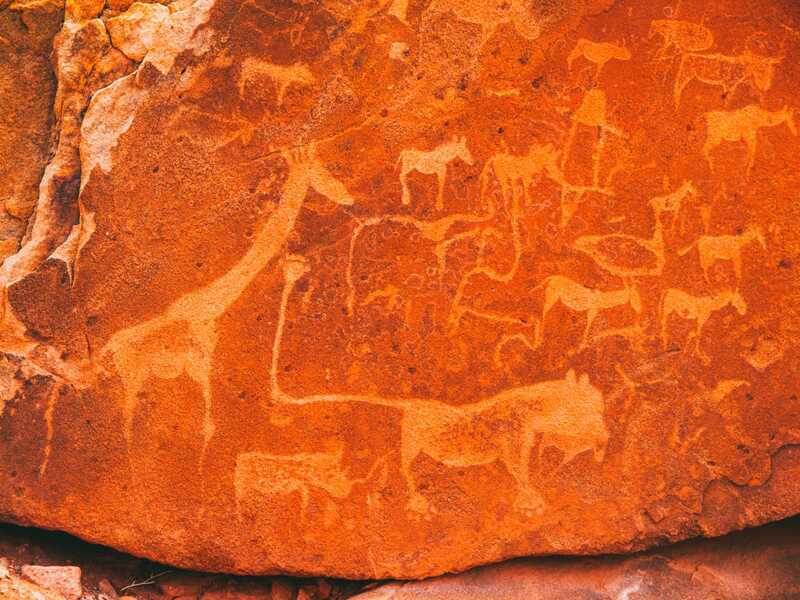 With pre-historic hunter-gatherer rock engravings that date back more than 6000 years and petrified forests at its doorstep, Twyfelfontein makes an obvious choice for us travellers wanting to explore one of Namibia’s most enigmatic locations. Just make sure to pack lots of water and an umbrella and hats. There’s little to no shade around here and it can get very intense around midday. 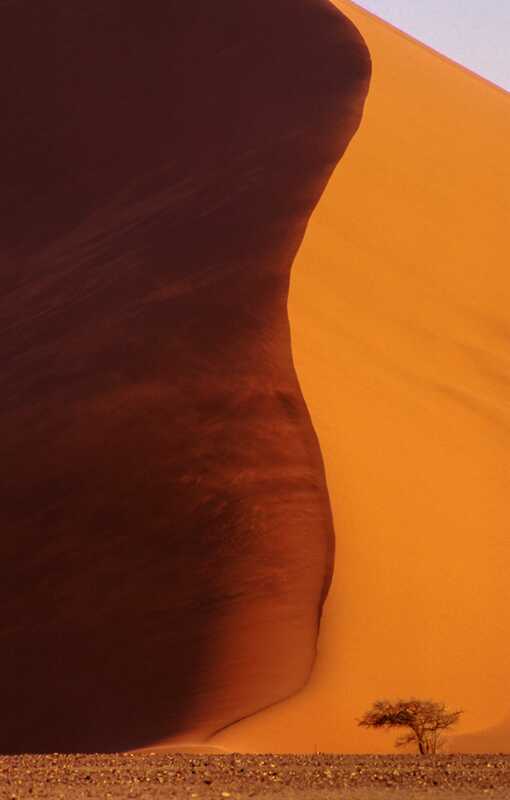 With imposing vermillion sand dunes sculpted by the elements, Sossusvlei is one of the most beautiful and imposing places you have to visit in Namibia (and that’s really saying something). 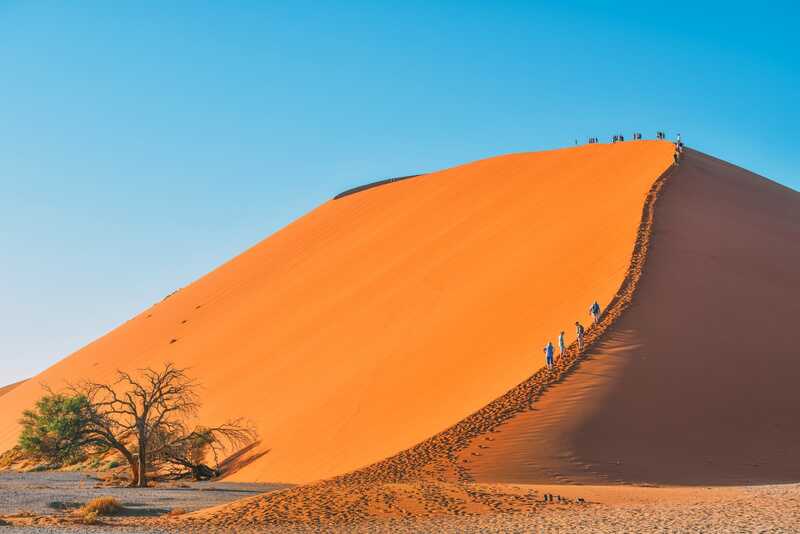 The large ephemeral pans are home to dunes that tower well over 325m high, and yes, you can climb them! 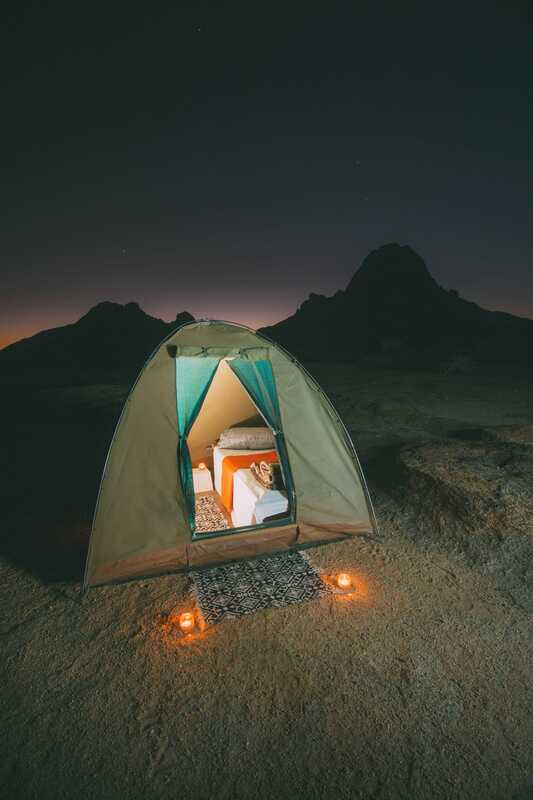 If you want to camp amongst the stars, think about heading to Sesriem campsite which is right on the border of the park – this way you can stay late and watch the sunset whilst in Sossusvlei. 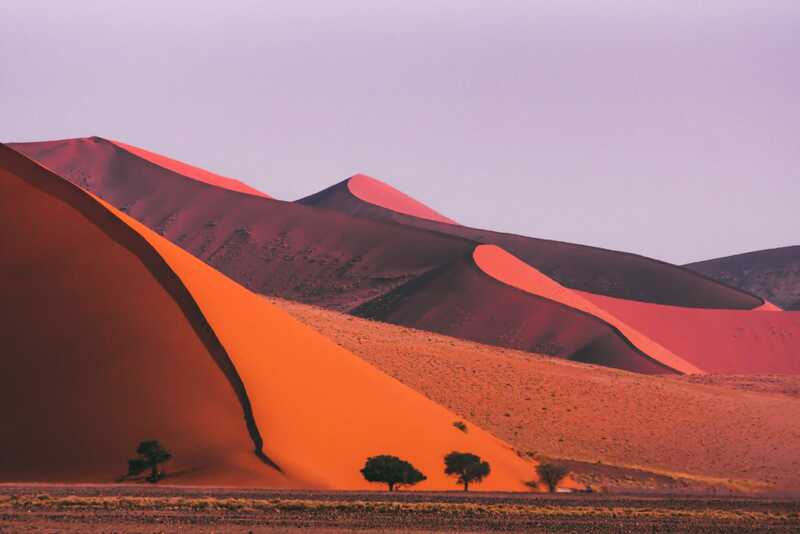 The dunes themselves are a 60-minutes drive from the gate of the Namib-Naukluft National Park, so plan your visit with plenty of time for travel (especially once you arrive). 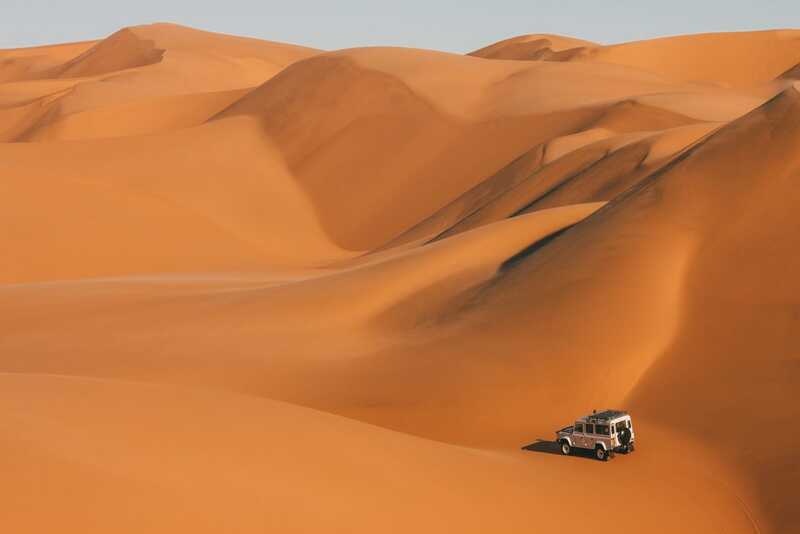 Straddling the Atlantic coast and the vast Namib desert, Swakopmund makes a great base for exploring the Namib desert and the Skeleton coast, as well as being a bona fide destination in its own right. 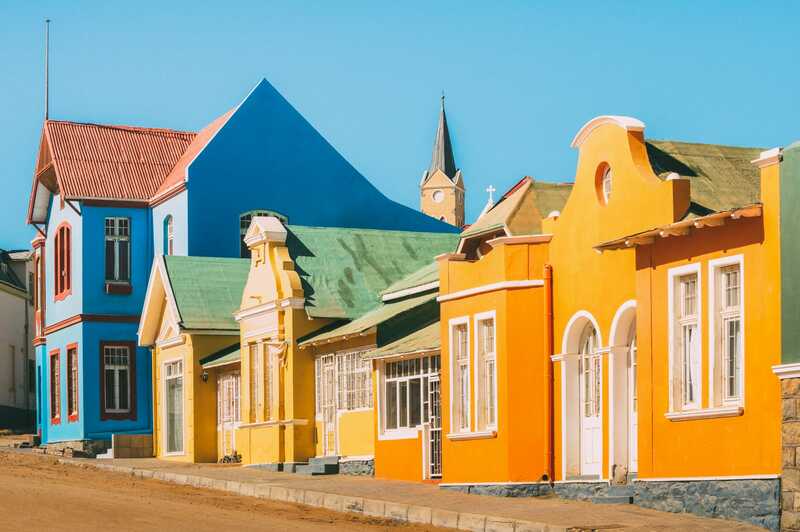 With a unique colonial feel and a happening seafront, Swakopmund is also a great place to see places like the Swakopmund Museum, Swakopmund Lighthouse and gorge at the Ocean Cellar who create some of the best seafood dishes in the city. No trip to sub-Saharan Africa is complete without seeing the abundant wildlife it has on offer. 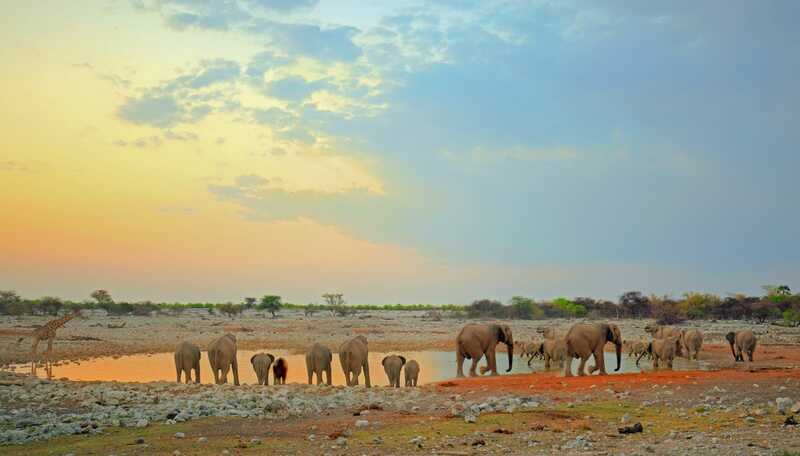 Etosha National Park covers more than 20, 000 sq-km and is one of the greatest wildlife viewing locations in Africa. Elephants, lions, springboks and gemsboks abound. 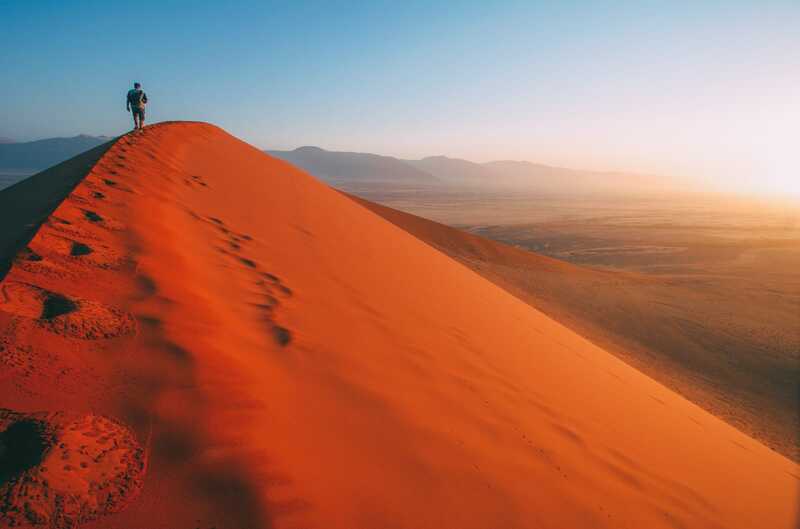 An ever-changing palette of deep rusts, vermillion, crimson and gold, the Namib desert is as treacherous as it is beautiful and makes for many days of off-road adventuring. 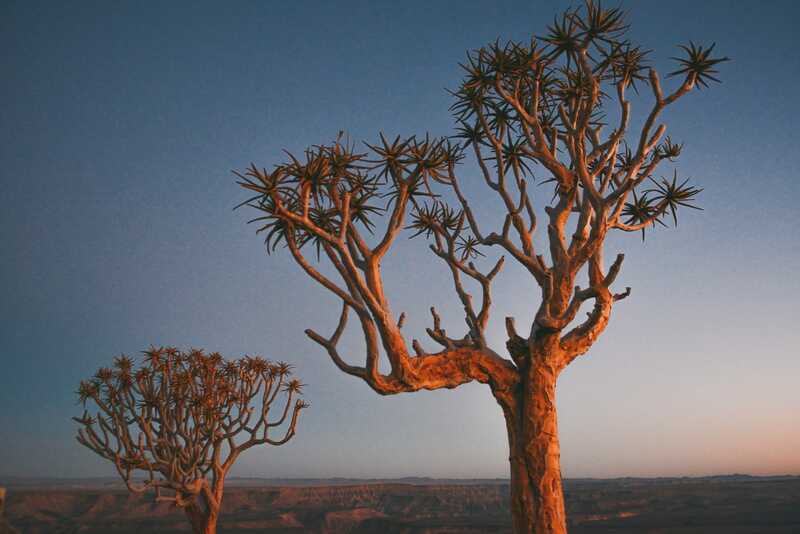 Thes desert is considered one of the oldest in the world (well over 40 million years old) and actually branches over to South Africa and Angola. The whole area is almost completely uninhabited and totally pristine. 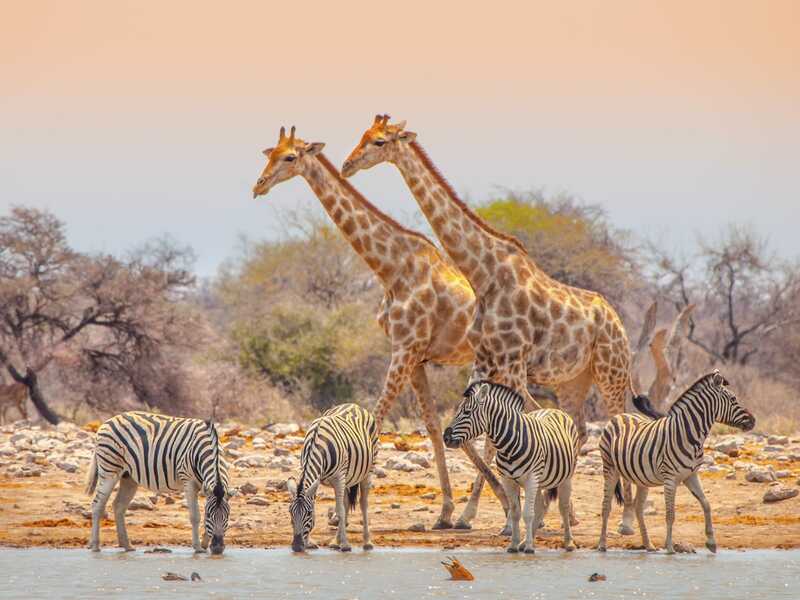 Make sure to visit the Bogenfels (arches that branch off over the ocean), Sesriem Canyon, Dune 45 and the small settlement of Solitaire – you might even spot a few Hartmann’s mountain zebra too! It really is one of the best places in Namibia to experience. 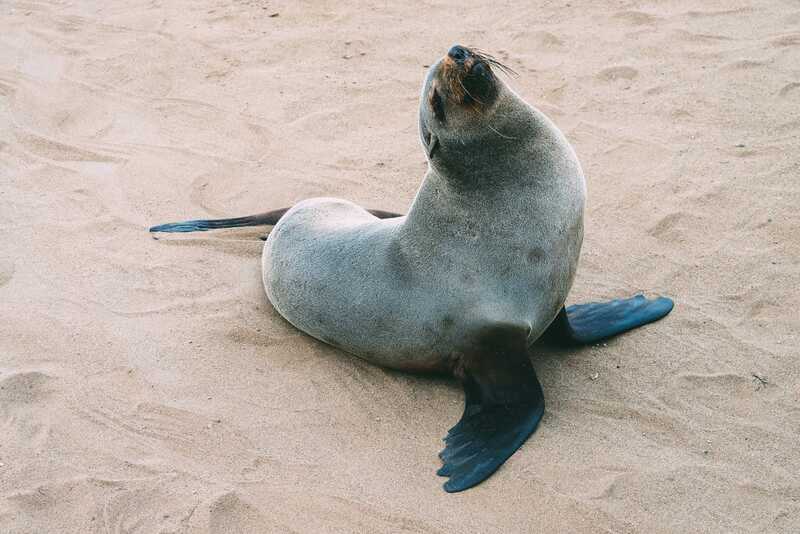 It’s not just lions and elephants that you can see in Namibia – the coast is famous for the Cape Cross Seal Reserve, a place where you can come and see 100s of Cape Fur Seals. 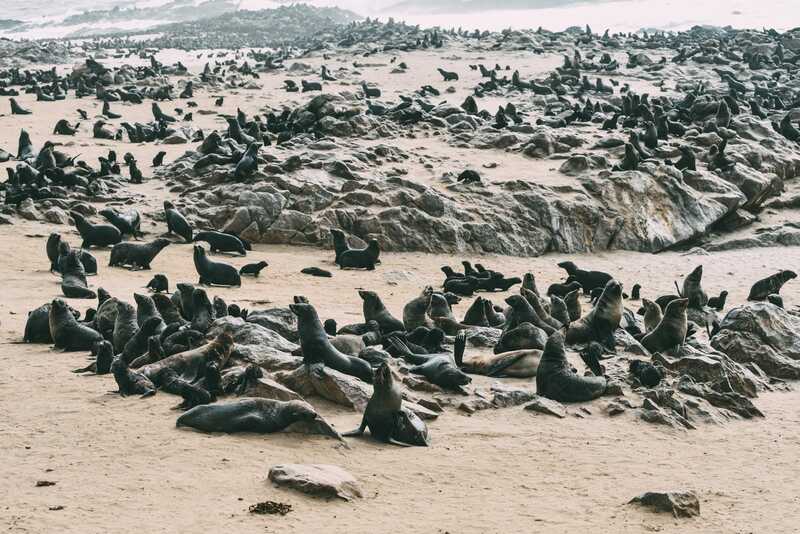 The Benguela current is home to a big population of fish so you can rest assured that the seals aren’t going anywhere anytime soon. Oh yeah, make sure to expect a pretty pungent smell from the seals. For some reasons, their breath is eye-wateringly pongy! 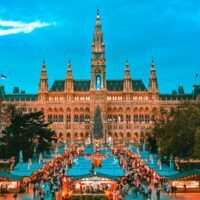 11 Countries You Need To Visit In Africa This Year And Why!